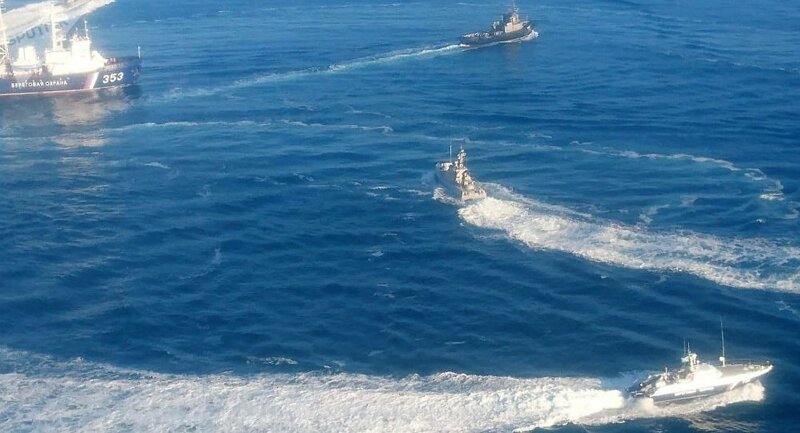 On Sunday, three Ukrainian ships crossed into Russian territorial waters in the Kerch Strait and were detained by Russia. This began a dramatic political escalation between the two countries, including Ukraine declaring martial law. A political expert told Sputnik Monday it was a carefully crafted provocation to advance a political agenda in Kiev. While Ukrainian President Petro Poroshenko has called Russian actions "unprovoked and crazy" and called on his allies to provide military assistance to "deter the aggressor," Moscow has maintained it acted within the limits of international law as well as a treaty between the nations governing traffic in the narrow Kerch Strait, which separates the Sea of Azov from the Black Sea. The area in which the Ukrainian ships were detained lies within Russian territorial waters, and those waters were temporarily closed for traffic, Russian officials said. 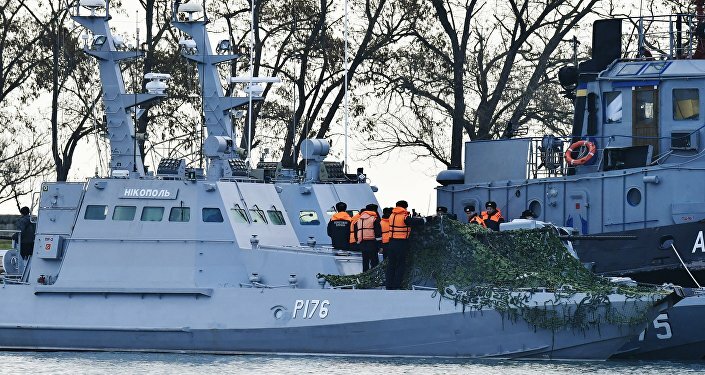 As the ships approached the Kerch Strait, Russian Federal Security Service (FSB) vessels went on to pursue the intruders, who failed to respond to demands to leave the area and proceeded to make "dangerous maneuvers," thus prompting the Russian side to open fire, Sputnik reported. The three ships were eventually detained and escorted to the port of Kerch. Kremlin spokesman Dmitry Peskov noted Monday that the Russian border guards acted in compliance with international law to curb the foreign intrusion and protect the country's territory from trespassers, who did not respond to any requests to withdraw from the area. Poroshenko also signed a decree introducing martial law in Ukraine that would be effective from November 26 to January 25, 2019. A further incident on Monday saw two Ukrainian vessels steaming "at full speed" from the port city of Berdyansk in the Sea of Azov towards the Kerch Strait, prompting Russia to deploy its own naval vessels as well as Sukhoi Su-25 ground attack aircraft to patrol the area of the Crimean Bridge, about 100 miles south of Berdyansk. Nikki Haley, the US' envoy to the United Nations, said Monday, "in the name of international peace and security, Russia must immediately cease its unlawful conduct and respect the navigational rights and freedoms of all states." Meanwhile, NATO Secretary-General Jens Stoltenberg called for all parties to avoid further escalation but also specifically on Russia to release the Ukrainian ships and their crews. Alexander Mercouris, editor-in-chief of The Duran, told Radio Sputnik's Loud and Clear said he didn't "think there was any doubt at all that this was a provocation" by the Poroshenko government in Kiev. ​While Crimea's union with Russia in 2014 is a sensitive enough issue between the two countries, more sensitive still is the Kerch Bridge, which opened only recently and which spans the 8.5-mile-wide gap between Crimea's easternmost point and mainland Russia's Krasnodar Krai. The road portion of that bridge opened in May, while the rail link is scheduled to begin carrying traffic early next year. Noting that Ukrainian politicians, including Poroshenko, have threatened to dismantle or destroy the bridge, Mercouris said, "The Russians are especially sensitive about it… given that this is so, any Ukrainian warships operating in that sort of area are going to be a very sensitive issue for the Russians, indeed. Any Ukrainian government ought to know that — and there's no question, it does know that — so sending warships in this fashion near that bridge and behaving in that kind of way was unquestionably extremely provocative and intended to be so." Ukrainian commercial vessels do have the right to pass through the strait to reach the important port of Mariupol', which the 2003 bilateral treaty between Russia and Ukraine delineates, albeit according to specific protocols to ensure safety as well as that the interests of both countries are protected. Through the strait also lies the Russian port city of Rostov-on-Don, only 100 miles east of Mariupol'. Russia's FSB said on Sunday that the Ukrainian ships had crossed the Russian sea border, entering the temporarily closed area of Russian territorial waters en route from the Black Sea toward the Kerch Strait. This move they identified as a violation of Articles 19 and 21 of the UN Convention on the Law of the Sea. According to the FSB, the Ukrainian vessels did not react to legal demands of the Russian coastal guard ships accompanying them and made dangerous maneuvers. They were detained after violating the Russian state border. Article 19 addresses the question of "innocent passage," which it notes is "innocent so long as it is not prejudicial to the peace, good order or security of the coastal state," which in this case is Russia. "Passage of a foreign ship shall be considered to be prejudicial to the peace, good order or security of the coastal State," the UN convention continues, "if in the territorial sea it engages in any of the following activities," which include launching or collecting military equipment, information, interfering with the environment in negative ways, violating other national laws pertaining to commerce and the threat or use of force against the coastal state. The FSB didn't denote how the Ukrainian ships violated this law. Article 21 notes that the "coastal State may adopt laws and regulations, in conformity with the provisions of this Convention and other rules of international law, relating to innocent passage through the territorial sea" in respect to a number of delineated areas, including the safety of navigation and regulation of maritime traffic, protection of navigational aids and facilities, protection of cables and pipelines and other items. Mercouris noted that Poroshenko "stands to benefit" from the incident and especially from the imposition of martial law, not in the least because it delays the holding of upcoming elections he is slated to lose to rival Yulia Tymoshenko and her Batkivshchyna party. While Poroshenko is polling at a measly 7 to 8 percent, Mercouris said, recent opinion polls place Tymoshenko at a slightly higher 18 percent. With another pro-European Union party threatening to steal his thunder, Poroshenko now has the opportunity to position himself as the "real hard-liner" who's standing up to Russia. Ukraine's presidential election is scheduled for March 31, 2019. Show co-host John Kiriakou noted that the imposition of martial law also gives Poroshenko the ability to muster troops much more quickly instead of the "days or weeks" it would take without these special powers. This is the first time martial law has been introduced since the 2014 Euromaidan protests in Kiev that ended Viktor Yanukovych's presidency, including during the height of the conflict in the Donbas, the burning of the Odessa Trade Union House and other incidents of mass unrest. "There is no conceivable way that the Russians would want a crisis of this kind at this point. They reacted to an extremely aggressive action taken by the Ukrainian side which was intended to be provocative," Mercouris told Kiriakou and co-host Brian Becker. "Russia has imposed no blockade on the Ukrainian ports like Mariupol', on the Sea of Azov; it is concerned, very concerned, about the safety of the Kerch Bridge, which now links Crimea to the rest of Russia, and the Russians have made very clear that they will protect it and that they will defend it. And that is what happened. And as I said, anybody on the Ukrainian side and anybody in the United States and anybody in NATO knows this and knows perfectly well that deploying Ukrainian warships in this very provocative way was guaranteed to produce a Russian reaction." Mercouris said there's no question that people in the US State Department and NATO secretariat "want to see this thing escalate even further," justifying further moves against Russia, although he noted that media in Europe ranges from critical of Poroshenko's motives to openly hostile to the idea of condemning Russia, favoring in some cases mediation between the two powers. "This is just a bit too transparently obvious a provocation by the Ukrainians," he said, "to credibly achieve some of the things that President Poroshenko and his backers in Washington want to do in terms of European opinion."